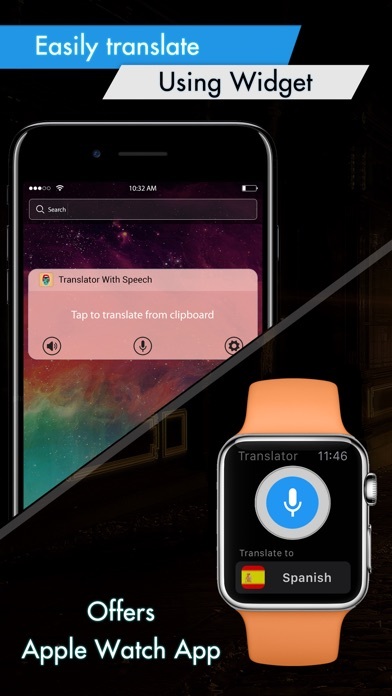 Use this cool talking translator to instantly translate any text into any of 88 languages! It also pronounces the translation for you. 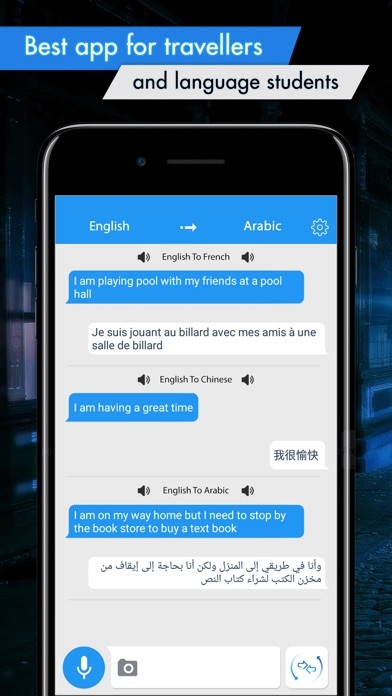 The new optional SPEECH TO TEXT feature allows you to translate your English SPOKEN text into any of many languages supported by this app. Stop typing, start speaking! 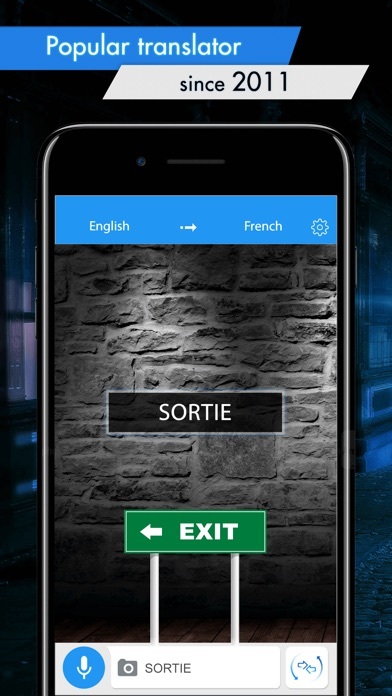 In this update, you can translate text spoken in 23 major languages (optional). Now in the app store for 4 years, with almost 3 million downloads, and an average user rating of 4.5! Thank you all! Unlike other translation apps, this one does not solely depend on one web translator. It produces superior spoken translations! This translator also stores previous translations in its database and allows you to prepare a set of translations in advance and play them back later without the need for internet and expensive data roaming. 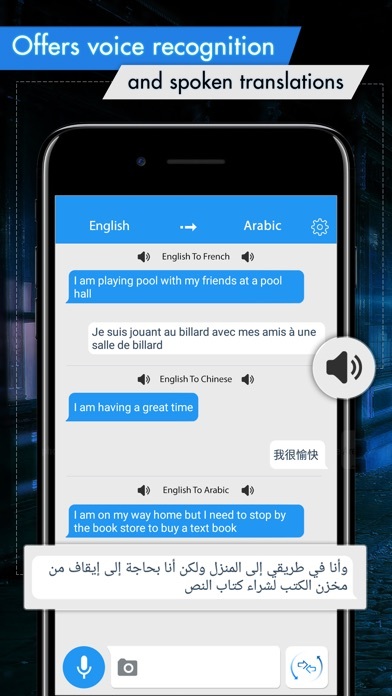 The application features: -Translation into any of 88 languages -Optional speech to text allows you to record your text in 23 languages and convert it into any of the many listed languages. -Remembers earlier translations, providing playback without internet -Just click to playback. Very useful when trying to tell that taxi driver where you want to go. 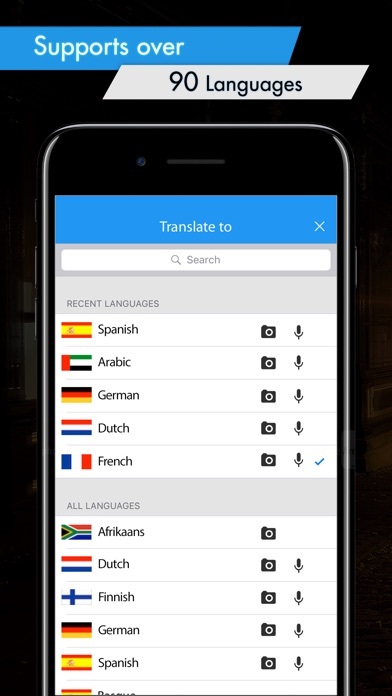 -Localization for 10 major languages -Transliteration support for non-latin character sets -Sleek user interface Supported languages: -Afrikaans -Albanian -Arabic -Armenian -Azerbaijani -Basque -Belarusian -Bengali -Bosnian -Bulgarian -Catalan -Cebuano -Chichewa -Chinese -Croatian -Czech -Danish -Dutch -English -Esperanto -Estonian -Filipino -Finnish -French -Galician -Georgian -German -Greek -Gujarati -Haitian Creole -Hausa -Hebrew -Hindi -Hmong -Hungarian -Icelandic -Igbo -Indonesian -Irish -Italian -Japanese -Javanese -Kannada -Kazakh -Korean -Lao -Latin -Latvian -Lithuanian -Macedonian -Malagasy -Malay -Malayalam -Maltese -Maori -Marathi -Mongolian -Nepali -Norwegian -Persian -Polish -Portuguese -Punjabi -Romanian -Russian -Serbian -Sesotho -Sinhala -Slovak -Slovenian -Somali -Spanish -Sundanese -Swahili -Swedish -Tajik -Tamil -Telugu -Thai -Turkish -Ukrainian -Urdu -Uzbek -Vietnamese -Welsh -Yiddish -Yoruba -Zulu Speech translation is provided for the following languages: - Afrikaans - Albanian - Arabic - Armenian - Bosnian - Catalan - Chinese - Croatian - Czech - Danish - Dutch - English - Esperanto - Finnish - French - German - Greek - Haitian Creole - Hindi - Hungarian - Icelandic - Indonesian - Italian - Japanese - Korean - Latin - Latvian - Macedonian - Norwegian - Polish - Portugese - Romanian - Russian - Serbian - Slovak - Spanish - Swahili - Swedish - Tamil - Thai - Turkish - Vietnamese - Welsh This application requires access to the internet to create a new translation. For the voice to text feature, the app has to be given access to use the microphone. Translator has helped me so much!!! Perfect for what it needs to do. Saves me from having to go to google now! It’s great. ‘Be learned a lot. This helps me learning a new language. My daughter in law is from the Philippines and it would be great if we knew some of her native language. You have “Filipino” on the app, but it just translates back to English. Use this with my students and it’s very helpful.